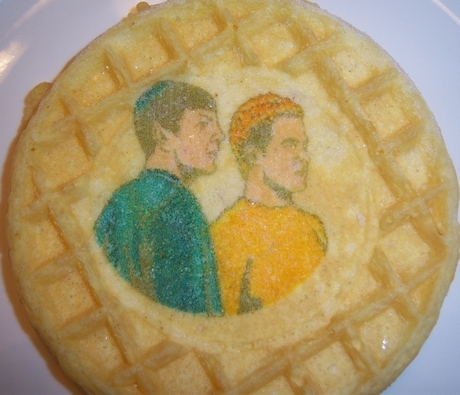 The Kellogg Company, producer of Eggo Waffles, released a limited line of Star Trek-themed waffles. They include 25 different images, icons, and phrases from the science fiction franchise. Sadly, many are taken from the most recent, nightmarishly-bad movie. You can view more pictures at the link. Yes, indeed, Star Trek has a mild case of bipolar personalities. I guess that is inevitable within a series many decades old and with not only many writers and directors, but many "creators" as well! Are we conservative or liberal today? Are we militant or pacifist? And are we going for melodramatic soul-wrenching or comedic frolics or philosophic ethics or stuff blowing up? Hmmm...you consider the recent movie "nightmarishly-bad"? I whole-heartedly disagree, as long as I can emotionally and mentally compartmentalize. I did not watch the new movie for the longest time, but after hearing many positive comments from people I respected, I gave it a try. I think the recent movie is a huge step in the right direction after the "nightmarishly bad" trend in the ST universe. From TOS to 2nd Generation to Deep Space Nine to Voyager to Enterprise, I think we've gotten steadily and steeply worse through the years. The new movie definitely turns it around for me. And I was ready to hate it. 1. They promoted a 19-year old boy to Captain and gave him command of a starship. This was wildly, impossibly unrealistic. Now getting back to the unreality of this youthification: there is a central principle to speculative fiction. It is that although situations and technologies may change, people are the same. They have to behave like human beings; they have to follow an internal logic. And it is simply not reasonable for a 19 year old punk be immediately taken off the Iowa plains, given a prized appointment to Starfleet Academy, promoted above all of his upper classmates, and then immediately commissioned as not only a junior officer, but a captain -- and then given command of a major vessel. This is stupid and asinine, and was only written because it makes 14-year old girls swoon. 2. The plot made no sense. It was fairly easy to discern that the writers came up with action scenes, and then designed a plot around them. It was never really clear who the hell this Nero guy was, how Starfleet came to learn that information, how he could carry out his plan, and how a teenager happened to know -- and be the only person capable of -- how to defeat him. The story should always come first, and then the special effects later. 3. They made a 19 year-old kid captain of a starship. 4. They made a 19 year-old kid captain of a starship. 5. They made a 19 year-old kid captain of a starship. Those are just my first five reasons for disapproving of this movie. "Those are just my first five reasons for disapproving of this movie." I still think it looks like genius compared to Enterprise. And Voyager.